These pets are featured because of their special meaning to Lake Veterinary Clinic. Our story began November 3rd, 2013. An employee from the Cat Protection Society called us on a Sunday afternoon, desperate for help for a dog they had found in the woods. We were presented with a critical dog that was unresponsive, unable to stand, subnormal temperature, severely dehydrated, anemic, numerous wounds to body and legs and emaciated from lack of food. This small sheltie was very close to death. Immediately our work began, with Dr. Laura Fisher and our techs performing numerous treatment regimens, as well as supportive care to cover all of this dogs issues. Diagnostics showed signs of organ failure, severe anemia, bacterial infections as well as a heart murmer. We knew that it would be a touch and go situation to try to save him. We worked for 3 weeks with continual treatment, with each day showing improvement and signs of becoming a normal dog again. We were all delightfully surprised to see how well he responded to treatment. At this time, the Cat Protection Society is beginning to wonder what they’re going to do with the dog. They knew they would need to find him a home. But how? NO PROBLEM!! we told them, we have the perfect family. Our contracted maintenance man, Bob & his wife Linda, have always had shelties and we knew they would be a perfect fit. And, they were!! Our “stray” sheltie who initially weighed 11 lbs and was close to death, is now “Tipiteau” a 27 lb. 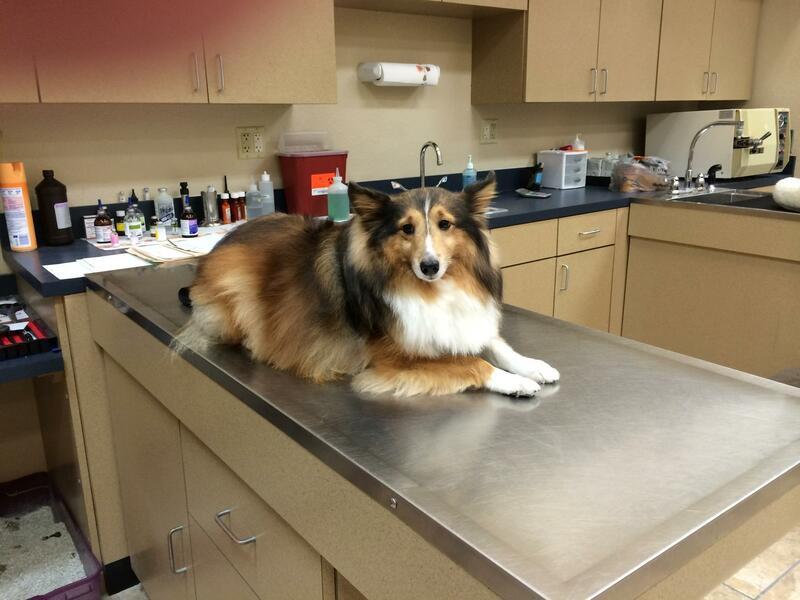 handsome and healthy sheltie who is living in a loving home where he is spoiled rotten. This success story is very rewarding to us. Our doctors and staff are dedicated to doing whatever it takes to help all of our patients. Every time we see “Tipiteau” we just say WOW!! What a difference 1 year makes. Thank you to the Cat Protection Society for rescuing this animal in need and contributing to his well being. Thank you to Bob & Linda for providing this once neglected and helpless “stray” a wonderful fulllfilling home. WHAT A LUCKY DOG !!! Lexie’s story begins on July 23rd, when her owner came home from a trip and found her laying on her side unable to get up with large multiple lacerations to her body. Her owners immediately rushed her to the Veterinary Emergency Clinic of Central Florida in Leesburg to get her help. It was obvious she had been attacked by something (???) and that infection was already spreading throughout the body as well as tissues to vital organs such as the lungs. Just so you can get a mental picture of how bad Lexie was, the following statement were the physical exam notes from the Emergency Clinic. PHYSICAL EXAM: Quiet, depressed, responsive. Patient was laterally recumbent on right side. Multiple lacerations over body. Right elbow swollen and painful, feels mildly warm to the touch. Small lacerations lateral right elbow. Two large adjacent lacerations with skin flaps (approximately 5″ across each) over caudel dorsal neck with muscle bellies exposed and damaged. Approximately 3 inch laceration over lateral left shoulder with muscle bellies exposed and damaged. Approximately 1″ laceration over left lateral mid thorax. Approximately 1.25 laceration over right lateral stifle. Necrotic tissue present at all wound sites. Now with this in mind remember Lexie is 13 years old, pretty old for a large dog, but her owners never gave up on saving her. Diagnostics and emergency treatment began that night, she was then transferred to our clinic for continued treatment. At this time, even with everything that we can do for her, the prognosis for her survival was still poor. For the next three days her owner (Mr.Krull) brought Lexie to our clinic every morning at 8:00 A.M. Each day we carried her in on a stretcher and immediately began I.V. fluids, pain medications, antibiotics and wound bandaging throughout the day. Mr. Krull then would pick her up at 5:00 P.M. to take her home where he could monitor her through the night, returning the next morning to do it again. Lexie slowly showed signs of improvement. After that her visits went to every two to three days, then to once a week for the next five weeks. Lexie’s wounds had to heal and close on their own, her heart and lungs were in no condition to undergo anesthesia and suturing. As of her last visit on August 28th her wounds have almost healed and we have her heart and lungs fairly stable. Lexie looks great and is feeling much better. She actually looks happy to come in and see us. Lexie reached all of our hearts with her gentle demeanor and her will to live. She let us do anything to her and never gave us any trouble at all, she knew we were trying to help her. 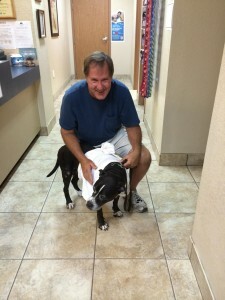 All of us here at Lake Veterinary Clinic truly believe her survival was possible due in part by the treatment and care from Dr. Thomas Oakes and to the dedication and timeless efforts Lexie’s owner (Mr.Krull) devoted to her care. Mr. Krull followed all of Dr. Oakes instructions and returned for every re-check as asked. Mr.Krull also assisted us with her treatment by bandaging wounds daily and administering medications at home. Without his love and dedication, she might not have made it. We all worked very hard to save her. Lexie is doing good at this time and she makes our day happy when we see her walk in and wag her tail as she greets us. Thank you Dr. Oakes for your care and treatment, and thank you Mr. Krull for giving Lexie every opportunity available to help her survive this ordeal. She is a great dog!! On January 21, 2014 “Ollie” began his recovery and new life. He was brought to us weighing 6.8 lbs. suffering from many of the typical shelter diseases, such as upper respiratory disease, ringworm, etc. For the next four months Heather and “Ollie” made many trips to the clinic for bloodwork and treatment. Due to the determination and dedication Heather put in to helping this cat following the treatment regimen recommended by Dr. Laura Fisher and the support the shelter provided for the treatment, “Ollie” now weighs a generous 13.75lbs. and is a happy, healthy cat. We would like to take the time to thank the Cat Protection Society for all the work they do to try to help all of the many many unwanted and homeless cats. Even with everything shelters offer and provide for these cats, it is still a stressful and abnormal life for many cats that cannot adapt. We know all of our clients already have many pets, but if you can find extra room in your heart and home for a shelter animal we could help some find a healthier and happier life. If you would like to know more about The Cat Protection Society or are interested in adopting a shelter animal you can click here to visit their website, or pay a visit to them at 2700 Getford Rd, Eustis, FL 32726. Call ahead for hours: (352) 589-6228. Mrs. Rowley is the longest devoted client of Lake Veterinary Clinic. She became a client back in 1962 (52 years ago)! At that time, Dr. Hartsfield, who established our practice, was one of only 2 or 3 veterinarians in the Lake County area. Ruth and her husband raised cattle and had always had dogs. This began her long relationship with our clinic. Over the years Ruth has rescued many dogs of all ages (both young and old) that needed homes. A total of 16 dogs throughout the many years have found refuge within the Rowley home: “Chi Chi, Slim, Mickey, Pookie, Bucky, Blackie, Pat, Beau Beau, Willie, Jezibel, Sam, Amos, Andy, Spotza, Pebbles,” and of course, her current dog “Wolfgang.” Several of these dogs were older shelter dogs that she adopted to give them a fulfilling life for the time they had left in this world. Mrs. Rowley gave them everything they needed, both medically and physically. It was because of the love and care she gave them that many of them lived to be very old. This is quite a list, but it does not stop there. This leads us to the present day with Wolfgang. Wolfgang was brought to our clinic from the Leesburg Humane Society. Wolfie, as she calls him, was in desperate need of a home, but he was a little hyper for most. We called Ruth, who at the time we knew had been looking for her next pet and new friend. She came to see him and said “if he needs a home, then he will have a home with me.” He has been quite the handful for Ruth, but she loves him none the less. He has probably been her biggest challenge to date. Mrs. Rowley, at the age of 92, still travels from her home in Fruitland Park to come to our clinic for her pet’s care. She is devoted to them and offers her pets everything that is necessary for a happy and healthy life. For this we at Lake Veterinary Clinic praise and admire her for the love she shows her pets and the love she has shown all of us for so many, many years. We love you Ruth and Wolfie!! Special Note: We currently have 2 young dogs that are in search of a loving home. Click here to read more about Nutmeg and Molly. They are our client and pets of the month for May 2014. The Booth’s have been clients of Lake Veterinary Clinic since the 1980’s. They have opened their hearts and home to past dogs such as “Lucky” a mixed breed, “Hope” a Border Collie, and “Jacob” a Shepherd mix. This brief story starts with “Rusty” on August 19, 2005. Gary and Beverly acquired “Rusty” in August of 2005, from that point on a numerous list of illnesses began. As a puppy he started with a cough and lung issues that sent the Booth’s to Florida Veterinary Specialists in Tampa for treatment. This was followed by routine skin and ear problems. Then in November of 2011, they found themselves at the University of Florida School of Veterinary Medicine for treatment and chemotherapy of a malignant melanoma that had been removed from “Rusty’s” mouth. Throughout all of this he has battled both food allergies, and studies have since provided “Rusty” with prescription diet pet food. If this is not enough, we still have “Molly.” In 2006 “Molly” was acquired by the Leesburg Humane Society and was brought to our clinic for treatment and spaying. Of course, this breed of dog is not that common and we immediately called the Booth’s since they had just gotten “Rusty,” another Irish Terrier. Being the animal people they are, they came and adopted “Molly.” She did not come without her fair share of medical problems as well. Bouts of pancreatitis, liver issues, and routine skin and food allergies also. Due to the exceptional care and treatment Gary and Beverly have given to “Rusty” and “Molly” they have been able to overcome many obstacles to provide them with a happy and fulfilled dog’s life. Thank you for being such a valued client for so many years! Nutmeg is our Pet of the Month for March. She is a 6-8 month old brindle Border Collie Mix. She is very sweet of disposition and is looking for a loving home. Nutmeg was found by one of our clients, but they were unable to foster her until a permanent home could be found. 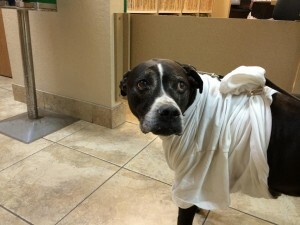 Lake Veterinary Clinic volunteered to assist with boarding and treatment for Nutmeg. The client has supported Nutmeg’s care with donations and other monetary assistance. When Nutmeg arrived she had a very severe skin disease called demodicosis. This is a parasitic skin disease caused by the Demodex mange mite. This mite is not contagious but can be very difficult to cure. Nutmeg has been responding very well to her treatment and at this point is 75-80% improved. She is current on her vaccinations and is heartworm negative. Nutmeg would love to enrich and brighten someone’s home. She deserves the best. If you would like to meet Nutmeg, please call Patti at 352-735-6047. Our very first Pet of the Month, on our new website, is appropriately featuring our clinic pet “Bonnie”. Bonnie deserves to have the spot light for her many years of service and contribution. Back in the summer of 1999, a cute pitbull puppy came to us hit by a car. Her front paw was severely injured. Due to the excessive length of time and cost of treatment, her owner never came to pick her up. By this time we all had gotten very attached to this puppy during her fight to save her paw. Once Bonnie was healed we searched hard to find a good home for her. After several attempts that did not work out, we decided she was meant to be ours at the clinic. Bonnie is still with us, but her physical health is starting to fail. We are proud of Bonnie and thankful to her for all the years of contributions for blood transfusions that she has given to save the lives of many pets. We no longer use her as a doner because of her age. We now provide her with the best medical & physical treatment she needs to live her life out comfortably. Thank You! Bonnie, we love you & congratulations for being Lake Veterinary Clinic Pet of The Month for January 2014.